Originally uploaded by HaSSan .S. Qamhia حسن سعيد قمحية. I was introduced to the wonderful flavors of knaffe by Adi Levinson a year ago. 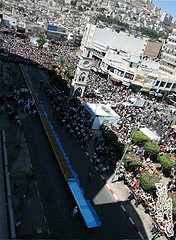 Now word comes from Nablus that the record for largest knaffe has been broken: 1,765 kilos (3,891 lbs) and 74 meters (243 feet) long. Awesome… wish I could have tried it. Congratulations!